In every vacation home there's a list of things that you'll want your guests to do before they leave. Like a lot of owners we have these printed and framed on the wall in a noticeable place. We also have them in our guest information book. 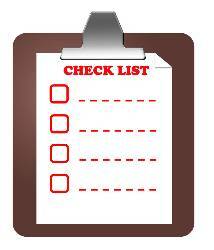 And we attach a copy of the checklist when we send directions to guests before they check-in. You can never over-communicate to vacation rental guests. Inadequate communication is the root cause behind a lot of problems that owners have with their guests. So as well as providing the check list in all the above places, we also have a supply of printed check-out checklists on hand that the cleaner puts out for guests. We try to present the list in a humorous and helpful manner. In our experience guests respond better to this than to threats of fines. We do still have some of that language in our rental agreements. But in the checklist we say up-front "This helps you avoid the sudden & unpleasant realization during your trip back home that you forgot to do something important".  In warm weather, leave A/C thermostat at 80 degrees. In Winter, 60 degrees.  Turn off all lights & appliances (incl. coffee maker & H2O cutoff behind washer) & return any moved furniture back to its original spot.  Close and lock all windows and doors (including the outdoor storage closet door). Leave both Condo Keys behind for the next guests: One (1) key must be left inside the lock box. And the 2nd key (with Pool Pass Card attached) must be left on the hook above the modem.